You can download the new Laggan Paths leaflet from the link at the bottom of this page and find out more about what you may find while you're out walking on the Flowers and plants page. Strathmashie Forest offers walks suitable for any level of fitness or ability. Take a gentle stroll along the path to Laggan village (the trail begins at the East end of the Wolftrax car park - the opposite end to the Laggan Wolftrax Centre), or follow one of the more challenging way-marked walks, perhaps the one leading to Dun da Lamh hill fort. 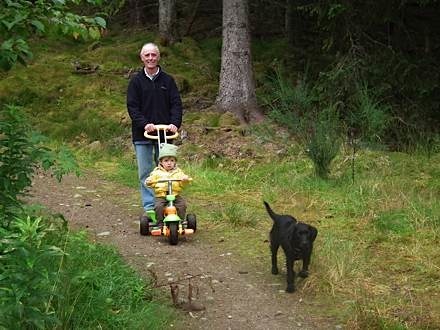 Behind the back of the Laggan Wolftrax Centre you will find the the quiet "pony trails", which offer a variety of walks of varying distances and gradients. There is something for everyone, even if you are pushing a buggy or encouraging a tiny tot to walk themselves. You can find more information on local walks on the Laggan Village website. Here are some other walks you can try; happy hiking! Ascent: c. 100m. Park at Gorstean car park, take forest road through gate onto loop section. There are amazing views from top but part of the path is currently blocked by trees blown down by the wind. Appropriate footwear recommended. Watch out for: Black Grouse, Ptarmigan, Pine Marten, Curlew and Red, Roe and Sika Deer. Distance: Approx. 1.8km – steep in sections. Ascent: c. 30m. Short fairly simple loop walk starting at Druim an Aird car park and taking in the waterfall viewpoint. Strong footwear recommended. Keep your eyes open for: Song Thrush, Buzzard, Pine Marten and Fox amongst others. Distance: Approx. 500m – easy going, not flat. Ascent: c. 100m. Parts of this route are currently blocked by trees which have been blown down, though it is still possible to find your way around. There are two ways to walk this loop – park at Druim an Aird car park – take forest track beside aqueduct. Easier route follows past cottage on forest track for two miles, turning left at the quarry to the top of the road. Loop path round ruins of Druim an Aird Village then follow path downhill returning to the aqueduct. To make this walk more challenging, walk the other way – uphill from the Rights Of Way sign and return by the forest road. Sensible footwear required. Look out for: Druim an Aird Village, Deer, Pine Marten and many more bird/flora species. Can be approached from either Achduchil or Pattack car park. Not for the faint hearted. Fantastic views in all directions. Spur path to Dun da Lahm (Pictish fort). Stout footwear and waterproof jacket essential. Ascent: c. 300m. Follow forest road past forestry houses through to forest gate. At junction continue right on forest road uphill to join the path along the ridge top. Re-join forest road (turn left towards mast for viewpoint). Follow forest road downhill then left (parallel to main road) to complete loop and return to Achduchil. Ascent: c. 300m. Follow forest road uphill to join path near mast (continue straight ahead to viewpoint). Take path up along ridge then follow down to re-join the forest road. At junction re-join path on left to return to car park. Watch for: Redstart, Tree Pipit, Black Grouse, Deer, Fox, Mountain Hare and the Pearl Bordered Fritillary. Ascent: c. 40-50m. Follow forest road uphill approx. 300m – turn right off road into forest, down past ruined croft. Turn right to re-join road and return to car park. The forest section is not constructed path so stout footwear is recommended. Start from the Laggan Wolftrax car park. Option to continue onto longer second loop.